The attached letter to the president listed two “positive developments” in FY 2009: the reduction in the delegation of original classification authority and an increase of “ten years or less” classifications. 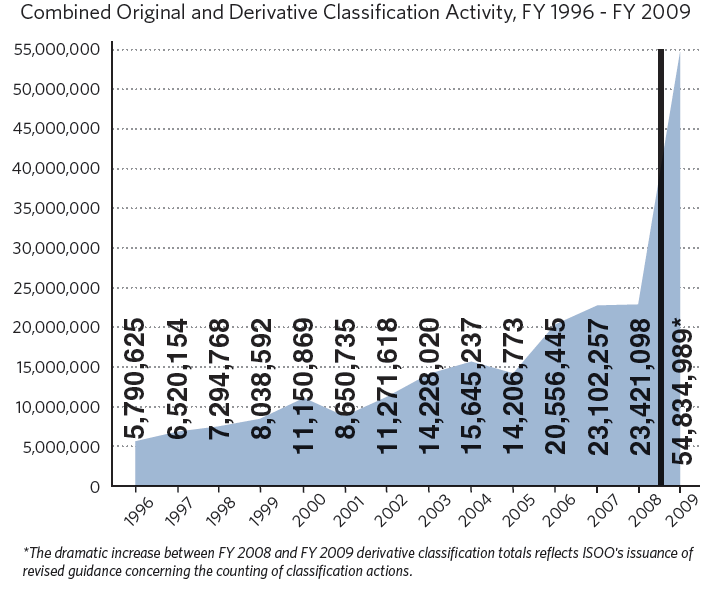 While there was a ten percent decrease in original classifications –which ISOO claims are “the only new ‘secrets’”– the overall number of classified documents, including those with derivative, or secondary, classifications rose. Intriguingly, the CIA reported making only four original classification decisions in FY 2009, calling into question the validity of some of the report’s statistics. The second positive development cited in the report was that “agencies assigned a duration of ten years or less in the highest percentage of original classification decisions since FY 1996.” Presumably, this means agencies are using “secret” and “confidential” -rather than “top secret”- classifications more frequently. Unfortunately, the report does not explain how a determination is made as to whether a document is sensitive for fewer or greater than ten years. Additionally, the increase in the creation of “10 years or less” documents does not necessarily mean they will be available to the public earlier. Documents are not automatically released to the public when they are due to become unclassified. Almost always, they remain unavailable until requested through the Freedom of Information Act. These requests can take years, even decades, to complete (even then, there is no guarantee the documents will be released); the National Security Archive’s FY 2009 FOIA Audit showed that the oldest pending FOIA request is more than eighteen years old. The report also provides a very intriguing breakdown of the Mandatory Declassification Review process. The report shows that MDR backlogs are growing and that “agencies have been unable to keep pace with the influx of initial requests.” Of the 3,102,323 pages of MDR requests processed between FY 1996 and FY 2009, 62 percent were declassified in full, 29 percent were declassified in part, and only 9 percent were denied. 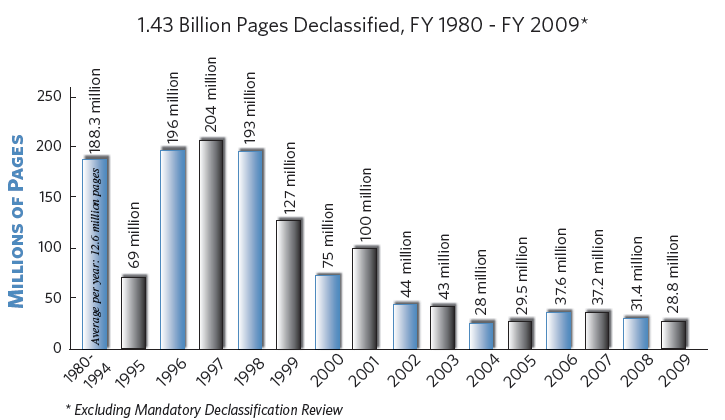 Of the 66,555 pages of MDR requests that were administratively appealed within the agencies, 17 percent were declassified in full, 43 percent were declassified in part, and 40 percent were denied. 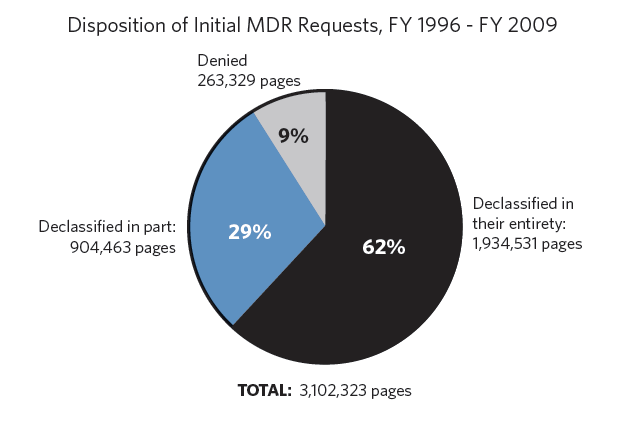 Finally, of the 841 documents reviewed by Interagency Security Classification Appeals Panel (the final chance to argue for a document’s release under MDR), 22 percent were declassified in full, 43 percent were declassified in part, and 35 were denied. The lesson to requesters: ALWAYS EXHAUST YOUR APPEALS. As the statistics indicate, MDR is a highly effective mechanism for citizens to access classified documents; it is in the public interest that the Reviews are expedited and backlogs eliminated. Is the ISOO a FOIAable agency? Yes, I believe so. But its not independent, its part of NARA.